In May 2014, the International Criminal Court (ICC) announced it would re-open its preliminary examination of UK military conduct in Iraq from 2003-8. In response, Britain put in place legal measures to address the alleged crimes committed by UK forces. These measures include a specialized investigatory unit, known as the Iraq Historic Allegations Team (IHAT), replaced last year by a smaller service police investigation, known as SPLI. Whilst British authorities argue that their efforts represent ‘a clear demonstration of complementarity in action’, therefore precluding an ICC investigation, others, such as Human Rights Watch, paint a more murk picture. 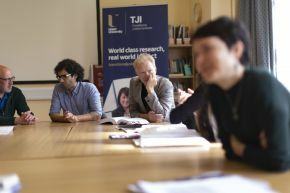 In this lecture, Thomas Obel Hansen willdraw on ongoing research that points to significant challenges in making positive complementarity work in the UK and reflect on what this tells us more broadly about the ICC’s complementarity regime.Thomas Obel Hansen is a lecturer in the School of Law and a member of the Transitional Justice Institute since January 2016. Thomas obtained his LLM (2007) and PhD in Law (2010) from Aarhus University Law School in Denmark.Prior to joining the TJI, he worked with the United States International University in Nairobi and as a consultant on assignments relating to international law, human rights and transitional justice in the country and the broader region.